Tammy reports, “When he got home, he kind of looked like the hunchback of Notre Dame. He barely made it in the front door. So I said, how about now?” and went with him to the hospital. Scott Carnahan reunites with the REACH 13 crew. Scott is no stranger to motorcycles—he’s been riding for years and used to race. “I’ve now broken 14 ribs and 18 bones,” says Scott. “They don’t call my husband ‘Crash Carnahan’ for no reason. He was really trying to be stoic,” say Tammy, who had been married to Scott about three years at the time. It all started in Row 8. That’s where Tammy, a flight attendant, had noticed a man watching a video on his laptop. Although most folks wouldn’t file a shooting video on the “Romance” shelf, in this case it did the trick. “My teenage son and I had just decided to go to shooting school,” Tammy explains, “and there’s Scott, who turns out to be Mr. Shooter Guy of the World. I wasn’t originally scheduled to be on that flight, and Scott normally flies with a different carrier.” Thanks to five hours in the air, the two had a chance to converse. Several weeks later, they met up. “That was it for both of us,” Tammy says. That fated 2011 meeting was followed by a 2012 wedding and a 2013 move to Big Bear Lake. This small city in the San Bernardino Mountains has a population of about 5,000 and an elevation of just under 7,000 feet. At the local ER, Scott figured he’d be given some pain medication and sent back home, but following a CAT scan of his chest, the doctor informed Scott that his injuries were beyond what the small hospital was equipped to care for. They would need to transfer him elsewhere. While the hospital looked for a ground ambulance, Scott told the doctor that he really didn’t need to be transferred. He said he’d had broken ribs before and knew how to take care of them. However, in addition to breaking six ribs, Scott had punctured a lung, and the doctor was concerned about possible additional injuries. “And there’s weather coming in,” the doctor said, “so we’ve really got to get you out of here.” Then came word that the ground ambulance was already off the mountain and wouldn’t be coming back up. It was time to call for a helicopter. The REACH 13 aircraft comes in for landing. 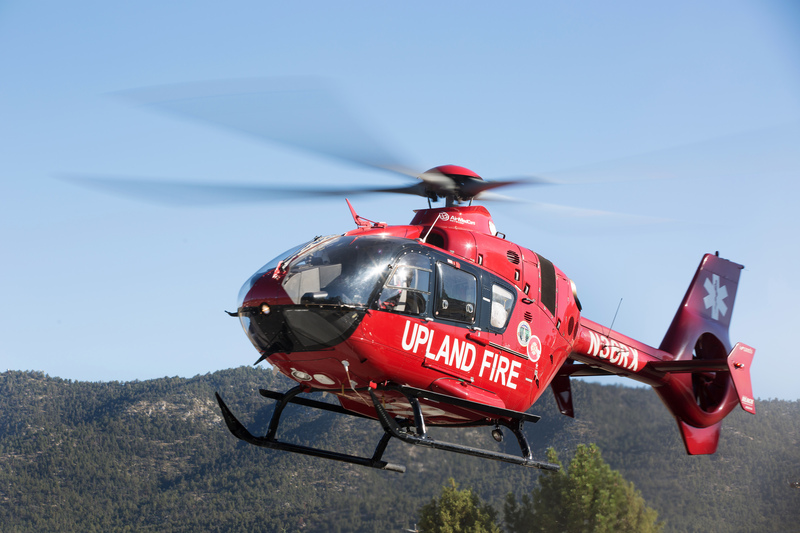 At REACH 13 in Upland, Pilot Chris O’Neil assessed the situation. “The storm was coming in, and the ceiling was starting to drop,” he says. After a thorough review of all the factors, Chris determined they could safely fly. But they needed to hurry. The crew, which included Flight Nurse Patty Cauthen and Flight Paramedic Greg Lattimore, prepared for immediate departure. “We got out of there just in time,” Chris reports. 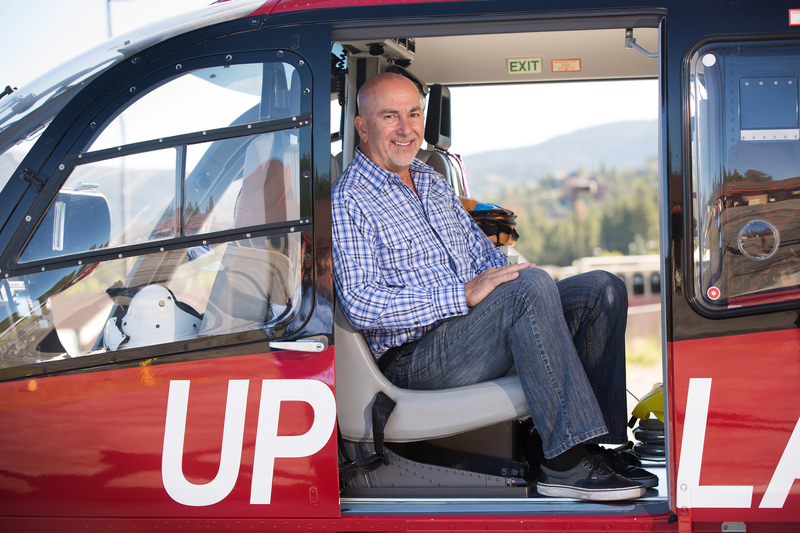 Meanwhile back on the mountain, Scott’s anxiety was somewhat reduced knowing that he and his broken ribs would take a twelve to fifteen minute helicopter flight versus an hour and a half road trip, most of which would have been a winding, bumpy downhill descent. 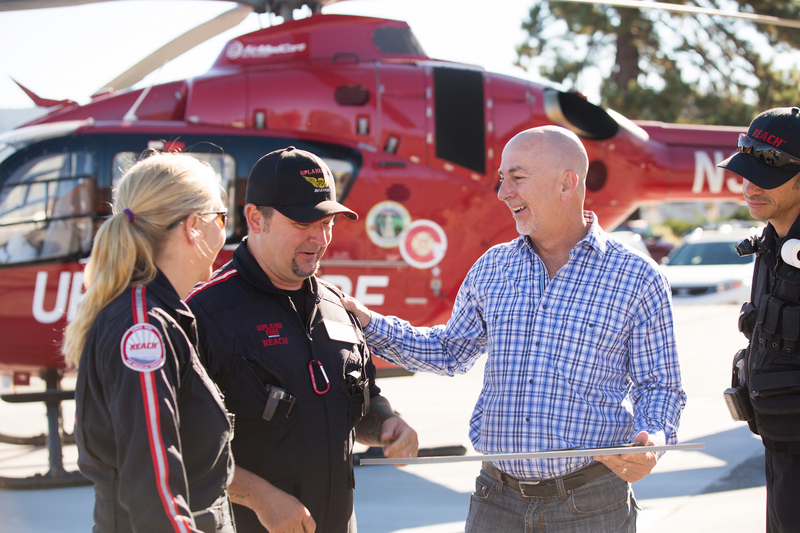 “I could see in his eyes that he wasn’t happy they were going to take him off the mountain…until he knew he was going by helicopter,” Tammy remembers. Also, Scott had done ride alongs with law enforcement in the past, so he wasn’t afraid of the flight. 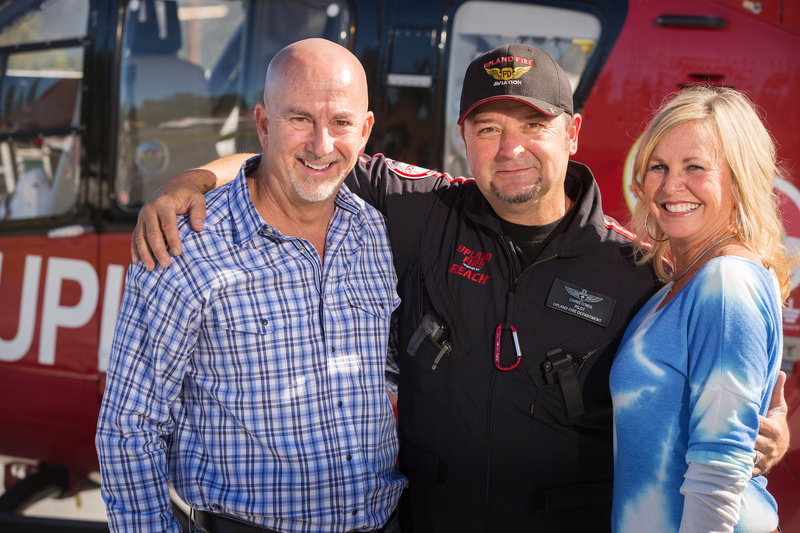 REACH pilot Chris O’Neil with Scott and Tammy Carnahan. Unfortunately, the storm kept Tammy from joining Scott in Loma Linda that night, but she was able to get there the following morning. Doctors at Loma Linda performed CT scans and multiple X-rays, and determined that surgery would not be necessary. However, just days after being released, Scott reports that he wasn’t doing very well. At first he tried to be a tough guy and fight through it, but he ended up back in the ICU. Yet another scan revealed a clot in Scott’s right leg, and a portion of the clot had broken off and moved up to settle on not just one lung, but both. This condition is called a Bilateral Saddle Pulmonary Embolism, and nearly 30% of people with this diagnosis die within one month. Recent evidence also suggests that up to 10% of pulmonary embolisms are fatal within the first hour of the onset of symptoms. Scott was hospitalized for a week, including Thanksgiving Day. He was prescribed Coumadin for six months and told to “take it easy”. Coumadin is a blood thinner used to treat clots, and can cause severe bleeding from just the slightest scrape or bump. Scott couldn’t afford to fall or in any other way injure himself while on the drug. “It was a rough six months for him mentally, not being able to do anything,” Tammy says. So how does Scott feel about the experience now that he’s out of the woods? He says he’s very thankful to everyone who offered support, especially Tammy. “I owe my life to her!” he states. REACH says cheers to that, and we’re betting there are more cheers coming from daughter Kate (29) and sons Cory (27) and Colter (19). Congratulations, Scott, on your wonderful recovery. We’re honored to have transported you! Scott gets a look inside the aircraft.